Looking for a new pair of Bluetooth earbuds? 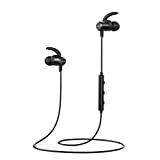 Don’t wait for Prime Day when one of the most popular pairs of wireless in-ear headphones on Amazon is already on sale at its lowest price ever. The Anker SoundBuds Slim Wireless Headphones have been favorites among our readers for a long time now, and they’re also best-sellers on Amazon. Right now if you use the coupon code SDBUDS35 at checkout, you’ll snag a pair for just $18.99. What’s in the box: soundbuds slim, Eartips, s/M/L inear-hooks, fit clip, shirt clip, Micro USB cable, travel pouch, welcome guide, our worry-free 18-month warranty and friendly customer service.